He happens to be the strongest man with will power, who never gave up his passion for films and after much herculean efforts, proved to be a winner as an actor and filmmaker. The actor-director Samudhrakani celebrated his birthday on the sets of Vijay Vasanth’s Achamindri, which is directed by Rajapandi. The film is a thriller starring ‘Megha’ fame Srushti Dange in female lead and Samudhrakani plays an important role. 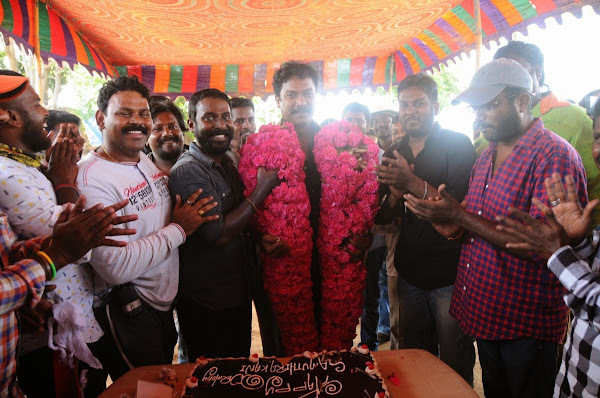 Yesterday on Sunday (April 26), the entire team members of this film surprised Kani by bringing a huge grand cake and celebrated on the sets. They are so happy that he spent complete day on the sets in spite of having this special occasion and this makes a title ‘Samudhrakani’s prideful birthday’.